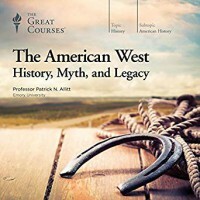 What I love most about Professor Allitt is that he is a Brit teaching American history to Americans. He has no baggage, nothing to defend and he has no qualms about telling it like it is. Manifest destiny and the taming of the West is sadly our contribution to the list of genocides and Allitt reminds us of this. He explains but he does not apologize for or attempt to justify the actions and behavior of those who settled the West. His lectures are rich with reading from primary sources, particularly journals.